Imagine a friend is putting together their own workshop and they’ve never owned any of their own tools. What would you tell them they need in order to get started, and what could wait until down the road? No matter what you’re working on, you’re going to need one of these hardworking tools for drilling holes or securing screws. Makita’s 1/2” cordless drill/driver can handle any project you throw its way, and it will certainly earn its keep. If you’re working with wood trim, crown moulding, baseboard, cabinetry or tackling any other woodworking projects, one of these will be your best friend. Makita’s 23-gauge pin nailermakes it easy to drive long pins (skinny nails) into even the densest of materials. You’ll want one that’s ultra-Compact with a lightweight design, but can still be counted on to perform well for heavy-duty cutting applications. Makita’s 7-1/4” cordless rear handle circular saw ticks all of those boxes and comes with tricked-out features like a two-stage safety trigger switch, LED charge level indicator, battery protection system, and a soft-start feature to gradually increase its speed. 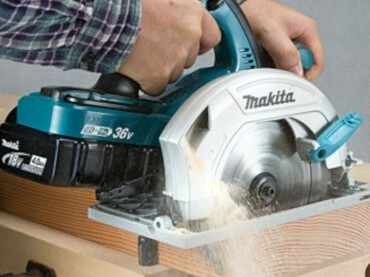 Sometimes called a “chop saw,” this is a workshop staple that you’ll find yourself using for most of your projects. Makita’s 12” dual sliding compound mitre saw can handle cuts up to 15”, has a bevel capacity of 45˚ left or right, and has a mitre capacity of 52˚ left or 60˚ right. Sometimes you need to cut curves and angles that only a jigsaw can handle. Makita’s cordless jig saw has three orbital settings for a more aggressive cut, a blower feature to keep dust off your cutting line, and a variable speed dial so you have optimal control over your work. You can’t work with wood and not have a sander for smoothing those rough edges. Makita’s 6” random orbit/finishing sander has a new and improved design for heavy-duty production sanding and polishing applications. Its low-profile design makes it easy to move around and get into tight spaces, and it’s easy to swap out the sanding pads. Sawdust piles up quickly, and you need to have a way to manage it if you respect your lungs. Makita’s cordless Cyclone vacuum cleaner keeps the air in your workshop clean and it’s great for small workshop spaces. Cordless tools are life-changing but you need to stay organized to make sure they’re always ready to use. Dedicate one area of your workshop to your chargers and extra batteries and be diligent about popping them on the charger after you’re wrapping up for the day. What workshop essentials did we miss? Let us know your favourite "can’t-live-without-it" gadget or tool!